Like any other writing assignment, a philosophy paper can be a challenge if you don’t know how to go with it. It is quite a different thing than writing an ordinary article as it is normally longer than that. 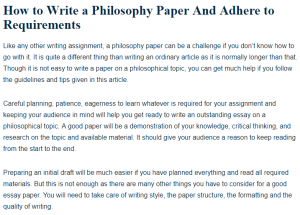 Though it is not easy to write a paper on a philosophical topic, you can get much help if you follow the guidelines and tips given in this article. Careful planning, patience, eagerness to learn whatever is required for your assignment and keeping your audience in mind will help you get ready to write an outstanding essay on a philosophical topic. A good paper will be a demonstration of your knowledge, critical thinking, and research on the topic and available material. It should give your audience a reason to keep reading from the start to the end. Preparing an initial draft will be much easier if you have planned everything and read all required materials. But this is not enough as there are many other things you have to consider for a good essay paper. You will need to take care of writing style, the paper structure, the formatting and the quality of writing. Keep reading to know about the phases of writing a good philosophical essay. This is the first and very important phase as in this phase you will get yourself ready with all that you need to prepare a draft. At this phase, you have to read relevant materials and take notes of important points. You will be outlining the basic structure of your essay with the ideas and notes. It will also include the arguments that you will be making in the actual paper. It is crucial that you have enough time for the preparation, so starting early is advisable. Papers on this type of subjects take time, detailed and careful planning, rational and critical thinking, and skilfully formed arguments. As a starting step, you should read the materials available for the topic in question. Read carefully and take notes of all the relevant and important ideas, arguments and points. This will be very helpful when discussing it with others. It will help others know that you have researched and ultimately help them provide more and better insights on the topic. Further, when you start reading the good material as soon as you get the assignment, you have more points to think about. It is essential to have a solid understanding of whatever you read in order to write an effective essay. It will help develop your ideas and arguments on the philosophical topic. Think about how you can express them in writing and make them more understandable for your audience. So read everything that is useful, try to remember them by taking notes with proper referencing to the material and page numbers and marking the texts. This will help you refer or read more about a point when you start writing the draft. You are writing for an audience. Your audience will include the professors and the classmates. So think about what they would expect from your paper. Consider that they have a good knowledge of philosophy and given topic. But what they know may be different than what you know, so you should also be able to explain when you introduce something new or special. A good content always will be easy to understand for its readers. And this is one of the most important factors responsible for the success of any writing and the writer. An outline is useful in drafting your paper without going off the track. If you prepare an outline for your paper carefully, you will include everything that is required. Thus it will be easy for you to know what is next and the chances of missing anything will be very less. An outline ideally should include your ideas for the introduction and your thesis. Further include the main points you are going to evaluate, explain and support with relevant evidence. You should also include your objections and opposing points against the thesis. In the last point of your outline, you should include the points for the conclusion. A research paper should have a strong thesis that can make it clear to the reader what is the focus point of the paper. Ideally, a thesis is presented at the end of the first paragraph of an essay paper. Your thesis should convey your main idea and your entire paper should support it with a clear focus. Once you are done with all the reading, discussion, preparing the arguments, main point and the outline, you are ready to write a draft. Think like a reader before you write anything. If you are a reader, you would like to read that you can understand without much effort. Obviously, your reader will be reading it only if they are interested in the subject. But this doesn’t require you to be complex in explanations and appear very knowledgeable on the topic of your paper. Your writing should be straight enough that your reader can understand. Write in the way you would speak on the subject when you are with your friends or in front of our professor. Avoid using two words if one can do the work. Writing in the shortest possible way will make your paper more interesting. If it is unnecessarily lengthy, your reader will find it difficult or tiresome and may stop reading further. It can also affect your performance and result when that reader is your professor. So make sure to write in short sentences and paragraphs. As in any other essay or research paper, an introduction is an important part. It will give your readers an overview of your work. It is an opportunity for you to take your readers a quick tour of your paper and raise their interest so that they read further. It is recommended that you introduce your topic right in the beginning without using too many unnecessary words. Your argument should be presented without leaving any doubt about what you are trying to convey. Your readers will read further only if they are assured that the information they are going to read next is about what you have introduced in the beginning. In search of the best academic paper writer? We offer you the best research paper writers for hire, giving you the opportunity to be sure of your results with each assignment delivered. After the introduction that will also be containing your thesis, you have to explain your philosophical argument. You have to present your points in support or against the argument. Make sure to write everything that can prove your point and put you in an advantage. It will help you when your professor will be reviewing it. Ensure that you explain only the relevant details. Next, you have to support your thesis. You will be evaluating your thesis with all possible explanations. To do this effectively, you can write about your personal experience or the example that you have observed or read during the preparation. If you want to make your argument natural, you should acknowledge potential objections and refusals that your audience may have. You just have to identify only the strongest objections and write your response to them. No need to cover all the objections, else you will end up writing too much about them. This may also distract you from the main concept and may affect the effectiveness of your paper. At the end of the paper, you have an opportunity to summarize the important points of your paper. This is generally a required section for most of the writing assignments, be it a scientific research paper, education paper or philosophical paper. In this section, you can clarify and emphasize the importance of the topic and significance of your work in the paper. It will help you explain how your work establishes the thoughts and presents useful insights on the topic. Once you finish the draft, it’s time to review your work. But you should wait for a few days before you come back to review. This is important to have a fresh view of your paper. Think critically about your writing and think from the reader’s point of view. While reading a sentence, ask yourself if it makes sense? Is it relevant and adding valuable information in the paragraph? Ensure that everything you have written is useful and remove if anything is not. When you read it, you should be able to get the point quickly, then only it will do the same for the readers. Note that reviewing is not just about correcting the writing issues like grammatical errors or spelling mistakes. It is about making your paper easier to read and understand. So you should be ready to make corrections and considerable changes where necessary. You may need to delete or improve entire paragraphs in order to make them meaningful. You also have to ensure that your content is focused on a center point. In short, the write up of the paper should be polished and perfect in terms of quality of information and quality of writing. It should also be easy to read and understand for the audience.